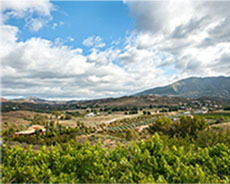 Mijas is a quaint pueblo in the south of Spain. If you decide to book your wedding or special event here at Hacienda San Jose in Spain many attractions / amenities can be found in this area. 5 minute drive away is the beautiful village of la Cala de Mijas, here there are numerous supermarkets, banks, bars and restaurants catering for every taste. This area of Spain has many beautiful beaches ideal for snorkelling, scuba diving, swimming, sailing on the deep blue Mediterranean or just simply sunbathing. All the towns and villages surrounding Hacienda San Jose each have their own fiestas during the summer months. these are not to be missed full of colour, character, sounds and flavours of Spain. 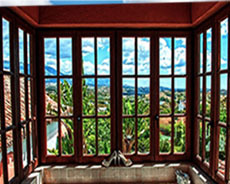 Horse treks and shows are very popular in Spain with many stables in the immediate area of Hacienda San Jose. the horse shows highlight the equine passion this area is famous for. There are many other sports that can be enjoyed like golf with an overwhelming choice of courses to be played. lots of tennis centres and numerous places to enjoy various water sports. La Cala de Mijas is home to the only racecourse in Andalucia with night races being held throughout the summer. 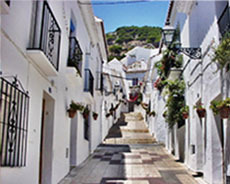 The whitewashed villages of Mijas pueblo, Benalmadena pueblo, Ronda and many more offer fabulous insights into the old Spain so don’t forget your camera! Malaga, Granada, Sevilla and Gibraltar offer a bustling insight into the modern Spain still fused with its historical past, and are all within a short drive from Mijas, Spain..
Away from the coast there are many places of interest these include the eerie caves of Nerja, national park at el Torqual, Antequerra with Geronimo rock and wolf park. Sierra Nevada mountain range and the lakes behind Malaga. 10 minutes away in Fuengirola is a waterpark called Parque Aquatico Mijas with lots of water slides and attractions. Also the Selwo parks are nearby as well, one is a marine park and the other you can go on a safari. Seaworld in Benalmadena and Tivoli World theme parks are also in Benalmadena. A short hop on a ferry will take you to the beautiful african country of Morocco which can be seen from the coast on a clear day.